Login in your Google Plus account and go to your profile page. Scroll to bottom of page and click Search visibility. Un-check Help others find my profile in search results and click save button. Done!! 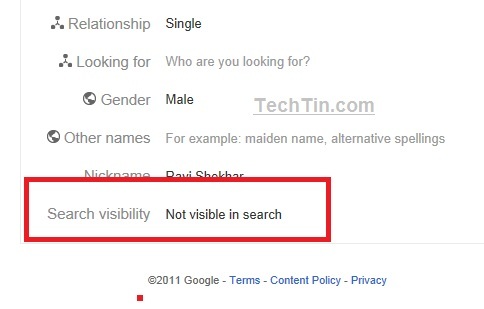 Now search engines will not be able to index your Google Plus profile page. If your Google Plus profile is already index by search engines, it can take few days to remove your profile page from search results. Doesn’t this make your profile private? Thus getting your account deleted? Please clarify. I think it will block only search engines and profile will continue to be public. Other people on Google plus can still see your profile. Its for all search engines including Google, Yahoo, Bing. Google should stick to providing a search engine but instead they are spying on people and now with Google plus they are using SSL to try and hide the spy-scripts that have naff all to do with recomending pages and everything to do with spying on your every move. G-Plus uses a HTTPS script to load another HTTPS script that then writes to a frame and the bandwidth goes up. Thank god Microsoft is trying to provide tools in IE8/9 to stop google in it’s track but only because MS wanted to be Big Bro instead of Google. What about G+ comments index, like Topsy. All my comments on public post will be displayed by topsy; can I avoid this?